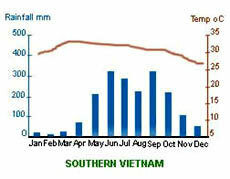 The climate of Vietnam varies considerably from region to region. Although the entire country lies in the tropics and subtropics, local condition varies from frosty winters in the far northern hill to year-round, subequatorial warmth in the Mekong Delta. 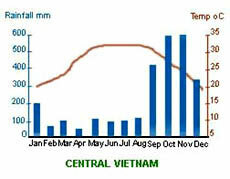 Vietnam’s weather is indicated by two monsoons. 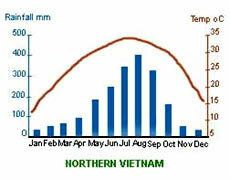 The winter monsoon comes from the northeast between October and March, bringing wet cold winter to all areas north of Nha Trang, and dry and warm temperatures to the south. From April or May to October, the southwestern monsoon bring warm, humid weather to the whole country except for those areas sheltered by mountains. For the best balance, try the months of April, May or October; For those sticking to the south, November to February is dry and a touch cooler; From July to November, violent and unpredictable typhoons hit central and northern Vietnam. It gets pretty crowded from November to March and in June and August. Prices tend to peak over the Christmas and New Year period, but if you don’t fancy sharing the sites with the masses, try to avoid these busy times. Some travellers like to time a visit with Tet (Vietnamese New Year), which is the biggest festival in the calendar in late January or early February. A nice idea but not ideal, as the whole country is on the move.